Of all the pregnancy complications, preeclampsia can be the scariest. It can happen to just about anyone at just about any time. It can be hard to figure out the symptoms, and it can be dangerous — and even deadly — to both the baby and the mother. The disease has been killing thousands of pregnant women each year for centuries, and doctors and patients still know very little about what causes it and how to avoid it. Sometimes the only thing that can be done to save the mom is to deliver the baby — but that can have serious consequences for the baby. It's a frightening battle that all too many women and their families have to face. We wish we had better news, but at least we have some information that you can arm yourself with. Here are 15 scary facts about preeclampsia. 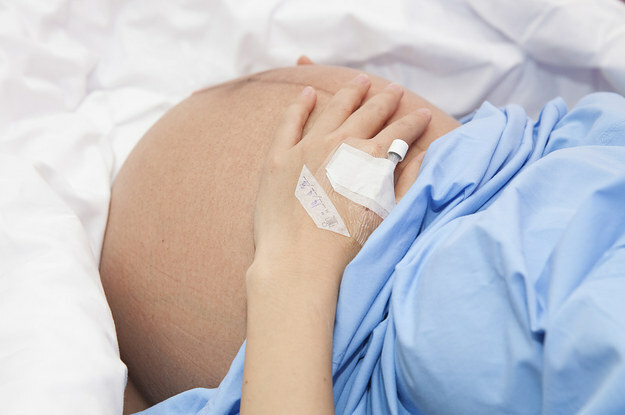 About 8 percent of pregnant women experience preeclampsia. That may not seem like a very big number, but it isn't small either. And there is a range of risk factors that could easily loop you into the category. First-time moms are at a greater risk; moms younger than 20 or older than 40 are at risk; moms who have a family history of preeclampsia are at risk; moms of multiples are at risk. Studies show that African-Americans are at risk, too. Other risk factors are obesity, a history of high blood pressure or a range of diseases such as blood clotting disorders, kidney or autoimmune disease or diabetes. The only clear way that a woman can reduce her risk is for her to lose weight before she is pregnant and to control weight gain during pregnancy, but the other risk factors you have little control over. The good news is that most women are not at risk of preeclampsia during their first trimester. The condition usually doesn't rear its ugly head until after the half-mark of pregnancy (20 weeks). After that point, it can happen pretty much at any time. In most cases, preeclampsia is diagnosed in the third trimester, but it can happen in any of them. It often resolves itself after delivery, but at times it can flare up after the baby is born. It's hard to predict when preeclampsia can occur, so you should watch for the signs throughout your pregnancy and recovery. Doctors aren't sure what triggers preeclampsia, so there are few suggestions for how to prevent it. One thing that you can control is your diet and exercise, so doctors are sure to talk to you about that. For obese women, restricting their weight gain during pregnancy to below 15 pounds can sometimes ward off the potential for preeclampsia, so that is a good tip. Be sure to drink a lot of water to stay hydrated, which can cut down on your swelling. Swelling is a key symptom, so it may help your doctor on a diagnosis to know if you are staying hydrated. For women at risk for preeclampsia, the U.S. Preventive Services Task Force recommends a low dose of aspirin each day, but you should be sure to talk to your doctor about that because aspirin has other risks for your baby. Even for women who freak out at every twinge and pain when they are pregnant, preeclampsia can be hard to spot. Some women have no symptoms at all. For some, the symptoms aren't uncommon parts of pregnancy and could be confused for normal baby bump woes. After all, many women have slightly higher blood pressure because of the increase in blood volume that comes with pregnancy. Swelling is extremely common, especially in late pregnancy or when the temperatures are hot outside. Some women brush off nausea as just a recurrence of morning sickness. Same with lower lower back pain, shortness of breath or weight gain. They all happen at some point during a pregnancy. But they could be a symptom of preeclampsia, so you should talk to your doctor. Preeclampsia is such a big deal that it has become a key part of prenatal checkups. Every time you go to the OB's office, you pee in a cup. That isn't so your doctor can check for drugs or alcohol. It's for a quick check of the protein in your urine. A high level could be a sign of a urinary tract infection, but it could also be a sign of preeclampsia, especially if your blood pressure is also high. That simple test could be the key to spotting a problem before it gets worse, so don't grumble too much next time you have pee in a cup. While some women don't know that they have developed preeclampsia until their doctors tell them, others know immediately that something is wrong. Some of the extreme symptoms of include severe headache and vomiting. You can also have blurred vision and pain in your abdomen, your shoulder or your back. Sometimes the swelling comes on quick, and you can become really anxious and have a hard time breathing. When the symptoms come on strong and fast, get to the doctor — or the hospital — right away. If your preeclampsia symptoms come before your baby is full term, you are likely to have to wait a long time before you will feel better. Doctors can do little for your symptoms more than monitor you to figure out when the baby has to come out — because the only known cure for preeclampsia is giving birth. So if you develop preeclampsia before the 37th week, bed rest is usually recommended. There isn't much research on whether bed rest will actually help much, but reduced activity and stress does often help keep people's blood pressure down. Whether you have to wait in a hospital or at home will depend on how severe your symptoms are. If you can, use the time to learn to knit your baby a blanket or to catch up on your Netflix. It could be a while before you are free to do much else. As Downton Abbey taught us, preeclampsia can kill. Many people may think that the likelihood has gone down with modern medicine, but about 76,000 mothers still die each year across the globe due to the condition. Many of those deaths are in countries with less prenatal care, but they still happen in the United States as well. HELLP Syndrome — the most severe form of preeclampsia — is especially deadly, killing as many as 25 percent of the women who develop it. It's critical that moms receive early diagnosis to help doctors save them. There is a real risk that your baby could die if you have preeclampsia — overall the stillbirth risk is 45 percent higher than if you don't have it. But the risk is mostly dependent on what stage in pregnancy you are when the symptoms develop. Because the best treatment option for severe forms of preeclampsia is delivery of the baby, the danger is the highest the earlier it comes during the pregnancy. Preeclampsia can come as early as 20 weeks — actually, even earlier in rare cases — and babies born at 20 weeks don't typically survive. It can also cause placental abruption, in which case your baby is in danger if it isn't delivered quickly. Your baby has a better chance the farther along you are, but preeclampsia can still increase the risk of fetal death by seven times when you are 34 weeks gestation, according to a Norwegian study. The statistics are really scary, so be sure to get medical help as soon as you can. As much of a pain that bed rest can be, it is nothing compared to some of the other treatments that you could have to take to keep your blood pressure down. Magnesium sulfate can help delay delivery and reduce your risk of having a seizure, but it can also make you pretty miserable. It can make you nauseated or cause diarrhea or vomiting. Confusion usually sets in and you can have problems breathing — for days. It can also cause your blood pressure to drop, which can make you dizzy, or slow your heartbeat. In fact, it can even cause a heart attack, kidney damage or even coma. Magnesium also has risks for the baby, including low bone density, which can cause fractures. But sometimes doctors believe the risk is worth the alternative. In the end, magnesium only delays delivery for a few days — usually long enough for some corticosteriods to help the baby's lungs to develop a little more. More likely than not, a premature baby will spend time in the NICU. The good news is that medical advances have meant that many babies born as early as 24 weeks gestation can survive and even thrive. The road can be long, though, and fraught with complications and worries. Depending on the gestational age, it could be months before you baby comes home, and it could be weeks before you are even able to hold him or her. There could be lifelong implications, such as respiratory problems or vision issues. Premature babies have to fight from the minute they are born, but the good news is that many of them overcome their early struggles and turn out even stronger. Prematurity isn't the only concern for your baby. There are other issues that can come with preeclampsia, which can lead to the baby not receiving the proper nutrition in the womb. He or she can be undersized at birth, even for the gestational age, and there could be development problems. Also, children who are born to mothers who had preeclampsia have a higher likelihood of suffering from coronary heart disease, kidney problems and diabetes later in life. Recently, researchers have determined that preeclampsia is linked to autism, with mothers of children on the autism spectrum more than twice as likely to have had preeclampsia. It is also linked with intellectual disabilities, which could be caused by a reduction of oxygen and nutrients to the baby's brain. For the mom, the effects of preeclampsia can last long after pregnancy. It could take up to two years for the blood pressure to normalize. Even past that, preeclampsia moms are at a greater risk for heart disease and stroke, as well as Type 2 diabetes, as they age. Talk to your doctor about your long-term health implications; cut out other risk factors like smoking cigarettes and control your weight as best you can. And be sure to be screened at various stages in life to catch any problems early. While delivery is usually the ultimate antidote for preeclampsia, in rare cases, it could develop or become worse after the baby is born. Postpartum preeclampsia can hit 48-72 hours after the delivery — or in even rarer cases, it can happen up to a month later. Blood pressure can spike and protein can be found in the urine, and the same kind of pains, vomiting and headaches can occur. You could be treated with blood pressure medication and magnesium sulfate to prevent seizures, and it can be just as grueling as the condition is when you are pregnant. If you had preeclampsia in your first pregnancy, you're much more likely to get it in subsequent pregnancies. The risk depends on the severity of your previous case and at what point it developed. The earlier it happened the first time, the more likely it will happen again. HELLP Syndrome is also very likely to recur in a second pregnancy. There is very little you can do to prevent it, so your doctor is likely to closely monitor you and keep an eye on the protein in your urine to try to catch the diagnosis early. A higher risk of preeclampsia is certainly scary, but it isn't necessarily a reason to not try for a second or third child. Do what you can to stay healthy and to keep your blood pressure in check. Keep in close communication with your doctor and be aware of the symptoms, so you can get treatment as soon as possible. We have every reason to believe that you and your baby will be OK, so try to stay calm. After all, we wouldn't want your blood pressure to go up.